A friend recently pointed out that I don't post many desserts. Far be it from me to deprive anyone from oozy-gooey goodness. This is recipe that has been sitting on my counter, just waiting to be baked and enjoyed. 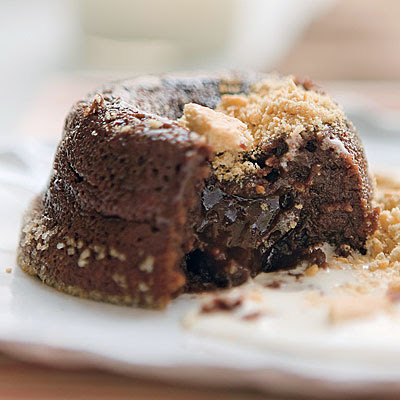 S'mores Lava Cake originally featured in Everyday with Rachel Ray SERVES 4 Prep Time: 25 min Bake Time: 15 min Ingredients: 1 stick unsalted butter, plus more for greasing 1/4 cup sugar, plus more for coating 4 ounces bittersweet chocolate, chopped 2 large eggs plus 2 large yolks, at room temperature 1 tablespoon flour 3 tablespoons heavy cream 2/3 cup marshmallow cream 1 graham cracker sheet (2 squares), finely chopped Directions: 1. Preheat the oven to 425°. Grease four 6-ounce custard cups, then coat with sugar; place on a baking sheet. In a medium bowl, microwave the butter and chocolate at medium power for 2 minutes; stir until smooth. 2. In a medium bowl, whisk together the eggs, egg yolks and sugar until foamy. Whisk in the chocolate mixture, then the flour. Fill the prepared custard cups two-thirds full with the batter. Bake until the edges are puffy, 13 to 15 minutes. 3. Meanwhile, in a medium bowl, microwave the heavy cream at high power for 30 seconds. Stir in the marshmallow cream until smooth. 4. Carefully invert the cakes onto plates and drizzle the marshmallow sauce on the side. Top with the graham cracker crumbs.